stations of the cross is back this year in hamilton - one of these years i'll make it over! you can download audio tracks to go with the stations here. the premiere of the insatiable moon was a wonderful evening. the film is based on the novel of the same name by mike riddell which follows the story of arthur, a man who has mental health issues. he thinks he is the second son of god and is part of a community of men with mental health issues who unite around a care in the community home. some members of the community are trying to close the home down to clean up the neighbourhood and others fight for its survival. the charm of the tale is that arthur does seem to mediate something of the presence of god. there are some very powerful scenes. difficult issues are tackled but with a warmth underlying the film and a love of the humanity of the guys. i guess every film is a long journey only i don't normally know about it. but because i know pip and mike i've followed the journey of this film on and off over 8 years or so. i remember pip saying he wanted to work with mike to turn this into a film way back! that journey has involved fund raising, script writing, recruiting, working out how to continue when a big funder dropped out and so on. in the end the whole thing was made for under a million dollars - i have no idea how exactly. so to see it being played around cinemas in new zealand and now opened in the west end was wonderful. it is actually going to be in cinemas in the uk in january/february so look out for it. you must go and see it. rawiri paratene plays arthur. he was the grandfather in whale rider which was an amazing film. he read the novel and as a result tracked mike down as he wanted to see it as a film and play arthur! it opens up talking about stations of the cross in hamilton run by dave white and friends (which i previously blogged about here taking street art to a new level when i met dave last year) which is a curious case of good timing as this year's stations of the cross is running in hamilton as we speak. you can see photos of them here and the audio for the stations is also online - it looks wonderful as ever. at the nosh gathering in queenscliff there were a group from incedo in new zealand. incedo is nzyfc re-invented as a mission order. i really liked what they were up to... dave white, based in hamilton, is running a stations of the cross art project on a huge scale outside in the public gardens. he showed us some photos and talked about it. about 3500 visitors passed through the 2008 one. they gather each evening and journey round the stations in groups. the team have to assemble and take down the stations each day for the whole of holy week. mark pierson who i always think of as the person who inspired lots of groups to re-invent stations said that this is simply the best stations in the world. i think he's right. it clearly began on a smaller scale inside a church building, progressed to more public space in a theatre and now is outdoors - see the history. the photos and video give an idea of the scale and the size of the task involved. one station involved people holding an ice cube with a leaf shaped cross in it - this meant making 4000 of them in advance. another involved a guillotine, another creating a 9m light shade suspended over a pond and so on. it's run by a loose collective of artists who 'share meals, paint brushes and the zeitgeist of the resurrection'. following on from the post about spirited exchanges a couple of posts back, chrysalis arrived in the post. this is the latest book by alan jamieson (who blogs here with paul). (i think i mentioned it before when i got the manuscript?). alan has written several books offering commentary on and research on church leavers. he has made the case that the journey they are on is valid and in some cases leaving church may even be essential to move on in their growth. i think his work has been very important both to help people in that space and to help churches understand the different journies people can be on. chrysalis is in the same area but it is a book aimed at the individual in that space of transformation on the journey of faith. it is a thin book (always a plus as far as i am concerned) and is absolutely wonderful. when i originally had the manuscript i immediately gave it away to some people who i could see were exactly in the space it was talking about. chrysalis is a wonderful book that will help many people on their journey of faith. there are many who come to a stage of christian faith where what once sustained them has grown dry and lifeless. no amount of trying harder seems to improve things. this can be a confusing lonely experience and resources to help people in that space are hard to find. chrysalis is a gift to the person in this place offering some signposts or a roadmap and encouragement for the difficult journey. this is a process many travellers have been on before, is normal and leads to transformation into a different kind of experience of faith. it's a book that many church leaders will find helpful to understand those seemingly restless souls in their communities, and to help imagine christian communities that can create spaces for people at different stages of faith. reading that list makes me think it's about maturing, growing up, taking responsibility. whilst it looks easy actually the journey through those things is anything but. the mystics have referred to it as the dark night of the soul or chrysalis with good reason. but if you are on that journey, this book will be a good friend. i love seeing what steve taylor and community get up to each year for advent. if i was in new zealand i'd love to join in. of course it's a bit different to what you can do in the uk as it's summer! well this year they have a peace labyrinth that has a wonderful promotion campaign and video. driftwood little people with eyes are being left around the city with a tag on saying take me to the peace labyrinth. you can read about it on steve's blog but do watch the trailer. this is fun, spiritual, in the marketplace, and totally over the top - brilliant. i look forward to seeing how it goes. in response to steve taylor's question: is there a missional agency for the missional church? steve taylor is today speaking to reps from mission agencies in new zealand on the subject is there a mission agency for a missional church? great to see this being addressed. however steve's original post seems to suggest that he assumes the answer is no - he describes his reluctance to even go for fear of being fed to the lions. i found all of this a bit odd - setting up a straw man kind of thing which is too easy to do so that you feel better for knocking it down. it obviously begs the question what steve means by missional but his recent response on that to alan roxburgh is to take a narrative approach and show how peoples' imaginations are shifting in a mission direction in his community trying to think how mission applies in their context. so taking a similar tack, this is a few of the things happening in cms, the mission(al) community who employ me. by way of an intro cms has been around a couple of hundred years and has been part of sharing the gospel of christ in cultures around the world. it's history is complex and contains a mix of inspiring stories of contetxtual mission growing indigenous expressions of church and expressions of church shaped by what i call a colonised imagination. encourage reflection and conversation - via a series of blahs around the country to wrestle with the mission challenges, a number of tours related to that with the likes of ryan bolger and karen ward and aland hirsch and mike frost. encourage virtual conversation and dialogue - via blogs, web 2.0 apps, sharing resources, linking people together etc. andrew jones, richard white, mark berry, and me are all part of the team i lead and are very much locked into the online conversations. networking and encouraging those on the journey - we have helped catalyse and encourage a number of networks. all networks should be relational if they are going to work. some of these are public and some hideen. but we value getting people together to share stories and support each other on the journey. we're not the experts in this. we're also on the journey. two examples of networks - an entrepreneurial network discussing talent and ideas to create social, spiritual and economic captial, and one of mission leaders/key players and communities in the uk. we get together a few times a year and yac online. we help co-ordinate greenbelt worship and specifically a venue for new forms of (missional) church. training - we are involved in a number of training initiatives - one example is ReSource - a year long training course for leaders of mission communities or people wanting to start them but we are all regularly training both the church as it is and the emerging new forms of church. mission praxis - we have people as part of cms (actually hopefully all of us) who are trying to learn what it is to be missional and have our imaginations reshaped. so mark berry is on my team developing something new in telford and inspires me regularly. i am involved in grace and we are trying to engage (one of our ethos words) in mission locally. we have initiated a team to do stuff at mind body spirit festival in london etc. to this we bring our imagination and creativity. i am working with a team to help try new stuff amongst youth in a rural area of britain to develop new expressions of church where they are clearly not going to join the existing ones. etc etc. richard white is part of dream, a networked mission community in liverpool and is catalysing the birthing of small mission communities elsewhere along with andrew jones. some of these will be in the institutional frameworks and some will be under the radar. helping develop residential mission communities - trying to work out to redsicover mission in particular places drawing inspiration from other mission(al) residential communities. a youth team who are currently touring the uk working with schools telling the story of the abolition of slavery and encouraging them to reflect and consider modern day slavery and how to get involved in campaigning against that. we are producing a dvd course for youth groups on mission that we will be giving away to thousands of churches next year. give people cross cultural experience - facilitating interchange and relationships globally between communities and leaders etc. i could go on... but i don't think cms ask me to do anything that isn't encouraging the missional church or that isn't missional. of course i get frustrated - it's been around 200 years or so. but there is great freedom and great will for change following the beckoning of god into the future. in all of these things we try and offer what we do as gift, as a contribution to the wider body of christ. we are fellow travellers. we don't heavily brand or control. we have a fund rasing department who i think get frustrated at times that cms is too hidden in our work. but we have to trust that as we do what we feel is right that it will encourage the kingdom of god and resources will flow. if they don't then i guess it will just all end anyway! thinking what god is calling us to be in a post colonial world. we have plenty of mistakes in our past (and we're not alone). part of this in the next few years will be cms africa and cms asia being independent. they currently have african and asian directors, staff and offices but governance is still by british trustees. so the future will be a networked family of mission(al) agencies with an interchange of theologies, people, resources all united by a shared (missional) ethos or dna. it's a struggle to re-emerge as this of course but it is clearly where the spirit is calling us to head. i'm excited about this. it will include a letting go of power and control (much of which has hopefully been let go already). i suspect it will also mean a lot less white people going to do stuff and a lot more of going to learn and share and interchange (a cms jargon word but a good one). two collegaues have just been to an exciting get together in africa (not amahoro though i am sure that was also good - a cms gathering of leaders) where they were there to listen and learn and it's exciting to hear the younger generation of african leaders tackling the post colonial question in their context. reconfiguring as a mission community - this is a bit of a technical anglican thing but cms is exploring shifting to a mission community recognised by the c of e - so it would have an episcopal visitor - in practice this will mean being part of cms will be to share a mission(al) imagination and spirituality and rhythm. what exactly this will look like we don't yet know. but i guess it's a quasi monastic thing. and we would be able to birth mission(al) communities which we are already doing anyway. thinking hard about europe - the mission shaped church stuff has led to a lot of creative experiments in the uk. it's a creative place to be. but many parts of europe are struggling with the cultural turn and mission challenge. so how can we help other europeans on the journey? cms has always tried to enable church to be missional in its context. we create a missional dimension as a living active force. it's dangerous because it challenges any attempt to define the church by an institutional centre. church has to be defined by mission. cms = msc (mission shaped church). [as an aside steve i think your defence in your presentation slides of local church as biblical basis for mission is a bit weak - the body of christ has of course local expressions but it also needs translocal expressions and movements and other forms - it's a typical move of a local church pastor in my experience but not one i buy in terms of ecclesiology]. all the things that we are attempting to embody - our programme - is ourselves. deconstructing and refounding ourselves. i.e. we have to be missional in our imaginations and praxis. we are committed to experimentation, mission delivery at edges. i'm going on so i'll draw to a close. please understand this is a hasty pouring out rather than a crafted article. in other words if i wasn't so busy i could do better! but in conclusion the reason i joined cms is that i think the two gifts that i see mission agencies have are insights about cross cultural mission (or contextual mission) and a window into the global christ and body of christ. both of these gifts are badly needed in our time and in the mission(al) church, particularly the latter. i also joined them because they offered to pay me to encourage the missional church! mark pierson always does something inspiring for lent. and he is usually kind enough to send me something in the post. when i got back from lee abbey last week a small packet of lenten reflections was waiting for me. these are a set of little cards - one for each day of lent. if you want to follow along, then there is a flickr set of the cards that you can look at each day through lent. similarly i always watch with interest to see what steve taylor and community will get up to for lent. 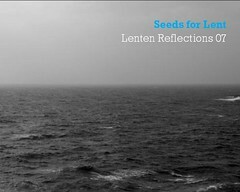 this year they have produced the lenten 7 pack - 7 images, 7 practices, 7 texts. they are business size cards that will fit into your wallet - spirituality to go. had a fab time at lunch today with alan jamieson presenting at cms on churchless faith and giving an insight into his latest research which is in a book published already in new zealand and being published in the uk in august. in it he basically follows up the church leavers whose stories are told in churchless faith. it was also good to be able to tell people about spirited exchanges uk - based on the inspiration of alan and jenny's work in new zealand we have been quietly setting this up in the uk. if you are interested in finding out what's happening or want to connect with other people in your area go and sign up on the e-mail list. greenbelt this year will be a good place to touch base in more detail with what's happening. we recorded the session today which will be added to the seuk web site or somewhere so if you missed it you can find out more. i'll let you know when it's up. steve taylor's series of emerging church postcards continues. steve taylor is posting a series of emerging church postcards. following my book dilemma within a few hours i had been sent a copy of out of bounds church by steve taylor free to read/review (thanks jay). steve spoke at a blah... two years ago entitled postcards from the missional edge and i now realise that was a sneak preview of the material worked up into this book. steve says that he is drawn to the border country or the margins - the edges are seedbeds of the future, where culture proliferates, places of great creativity (and i would add places where trickster likes to hang out in the mythologies). steve is running a site connecting to reviews etc on the book, the most comprehensive of which is darren's. i have also recently read steve's thesis from his phd which obviously goes into some stuff in much greater depth. perhaps the greatest question facing the emerging church is how to integrate spiritual tourism with the notion of redemptive community. how do we create communities flexible enough to weather the constant influx of new people and ideas, yet stable enough to provide consistency for those who commit themselves to those communities? how do we create communities taht are open enough to welcome the tourist, yet orthodox enough to remain grounded in the trinue god? he then uses sociologist zygmunt bauman's notion of peg and ethical communities to challenge various emerging church genres to be more missional. he manages this in a way that is affirming of what those groups do but nudges them in the right direction. grace fits in to what steve describes as alt worship as an art collective model that offers plenty of peg community (for spiritual tourists) but struggles to move people to more commitment (ethical community) unless they get involved in the core planning group. steve (the other steve) has this diagram that captures it well on small ritual as i blogged yesterday. we are in the middle of a discussion about precisely this issue at the moment so this is a pretty timely chapter for me personally which is possibly why like darren i think that is the best chapter in the book. (there is also a suggestion in this chapter of festival spirituality as a model for creating a missional community/church that is crying out for someone to pick up and do). i also like the stuff on sampling and mixing and DJing as metaphors for constructing church and worship - in my dissertation i used similar ideas (somewhat more pretentiously) with the idea of bricolage... steve also draws heavily on de certeau who i found a real inspiration for my dissertation as well. thanks for taking the time to write a book steve and put your thoughts out there. i have blogged before about fractals, the self published CD ROM by mark pierson and cityside. and on the basis that mark has produced wonderful alt worship over the years i bought some in faith to sell via proost. well i have finally got round to actually reading through the CD ROM myself, so thought it worth saying some more about it. it contains a real wealth of resources - it would be a fat book... and in it are shared the worshipping life of cityside and resources from their services over the last decade. This prayer of Confession will be ‘visual’ rather than ‘verbal’. Even though I’ll be talking all through it! The ‘visual’ part is ‘mental’, that is, ‘interior’. It is a very old form of confession, going back, if I understand it correctly, at least a good 1200 years. It goes by the rather unwieldy name of the ‘Review of Consciousness’ and was, I think, begun by the Franciscans, who still use it today. So if we begin with the whole ‘bowing head/shutting eyes’ thing we’ll move into it. We’ll start with becoming aware of yourself. Yourself as your ‘self’. Not as yourself in relation to others. Start by coming back into yourself. Then, notice what is happening with your breathing. If it is in your throat, or chest, relocate it down into your stomach. Get comfortable with breathing from your stomach. And stay with that for a few minutes. Then, when you’re ready, remember back to some moment in the last week about which you are not happy - not happy with yourself in your response to something. The response may have been an action or even an interior decision. Begin by recalling the situation. Then the details of the scene. The light, the space, the objects. Notice what was around you. Now move slowly forward into the moment of decision. When you get there, pause. Just hold that decision. Do not be in a hurry to excuse yourself or condemn yourself. Even condemning yourself can be an evasion. Stay there in that moment. Allow yourself to experience everything you can about that decision, however small it is, however unpleasant it is, and everything about that moment. You can contain it. You may notice that your breathing begins to constrict or tighten at this point. Let it relax back down towards your stomach. Keep with the breathing from the stomach, and then return to the experience of your decision. Now, allow yourself the space and the time to make another decision. A different decision. Your new decision might be one of simply not taking the course you previously did. It might be a decision of ‘restraint’. Or, you might choose a more positive course of action. There might be other possibilities from which to choose that were latent in the situation. This is one of the reasons for spending the time reacquainting yourself with the scene at the outset. There might be clues in different parts of the scene that allow you a totally different response to it. Sit for a few minutes exploring them. Even just acknowledging that they exist. Then move back into the making of the decision. And this time, go with your new choice. And let that unfold. And follow-through. Again, don’t be in any hurry to evaluate or assess the choice. Just allow it to occur. Allow yourself to notice it. When you’re ready, let go of the scene. Leave it where it is. And come back to your breathing. Relocate it, if you need to, in your stomach. And become aware of yourself as your self again. And then, if you want or need, in relation to others. And then, when you’re ready, open your eyes. This exercise is something the Franciscans apparently do at the end of every 24 hours. It’s a major achievement in my experience, to remember even once in a week. But the idea is to close out of each day with this exercise as a way of decompressing. And over time, the capacity to do this exercise begins to move from a thing that occurs ‘after the fact’ with various actions and becomes, instead, a small pocket of possibility within each situation and action. all the individual word files are included so that you get the text files for all the pieces and the service ideas. this may sound strange but it needs to be published as a a book. it's beautifully done and good value as a CD ROM but i think many of the churches who would incorporate this thinking and resources into their worship are much more likely to do so if there was a book. and it's a mainly text based resource. for example at st mary's that grace is a part of, i can think of a few people to give a book to but i don't know if they'll read it as CD ROM? if there are any publishers who follow the blog snap this up and get it in a book format so it can be more widely shared. this is a gift - thanks mark/cityside for your journey and for sharing it with the rest of us.